ESCKAZ motto is "Delivering Eurovision News First". As usual our team is officially accredited and will be providing to you Euroweek news from the beginning till the end in complete details. Daily, from May 06 till May 24 on ESCKAZ.com VIENNA BLOG you'll be able to find the latest information directly from Eurovision 2015 capital: reports on rehearsals, press-conferences of participants, fan and other events. 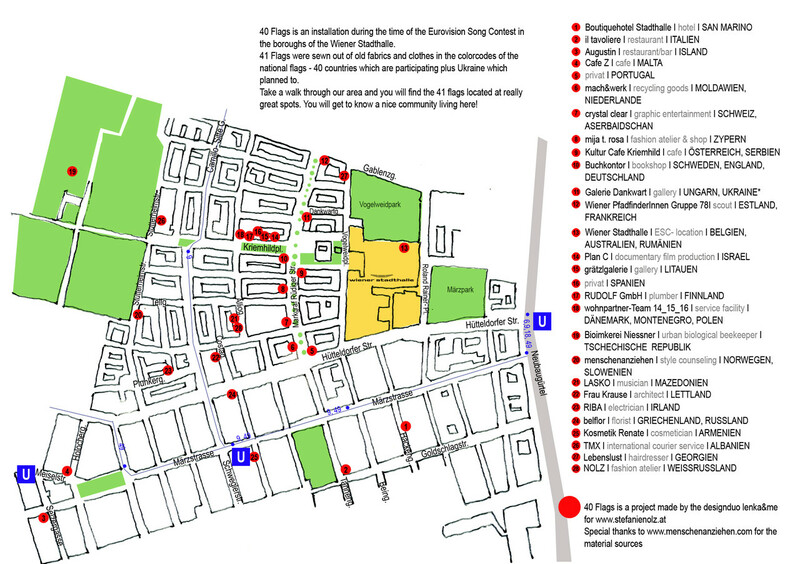 We will also try to report on events happening outside the press-center, Euroclub and Arena in the city. In the last 3 years ESCKAZ Euroweek coverage has been the most visited among independent ESC fan sites, culminating in 4.000.000 video views from Euroweek in Copenhagen, so we'll try to keep standard equally high in 2015 as well. Be sure also to follow our Twitter and Instagram - your sources for the latest news. Full schedule of rehearsals, press-conferences and other events is available at ESCKAZ Eurovision 2015 guide. This page will NOT be updated during Euroweek period, so please, bookmark our blog. With Eurovision delegations gathering in Vienna from Saturday and first rehearsals starting on Monday, it is time to wrap up coverage of the intermediate period between National selections season and Euroweek and look on the pre-contest favourites for Vienna. Bookmakers are split between Italy and Sweden being favourites, with Australia and Estonia also being close. Russia and Azerbaijan are present in top 7. The outsiders of the campaign are Portugal, San Marino, Czech Republic and Switzerland. Italy and Sweden are also battling for the OGAE voting victory as well with Estonia, Slovenia and Norway in the top 5. Final results are expected to be revealed on May 10. Estonia has topped both leading online polls: ESCStats poll over Italy and Sweden and ESCNation poll over Sweden and Slovenia. It has narrowly lost to Russia at ESCKAZ own poll with again Sweden and Italy coming up next. ESCKAZ team plans to record own video review of participating entries on May 10th in Vienna. A musical bridge from the past to the present, connecting generations and nations with each other - in the interval act of the final of the "Eurovision Song Contest 2015" Austria is presented as a land of music, as a country in which music is deeply rooted, the musical tradition is alive and progress continues. 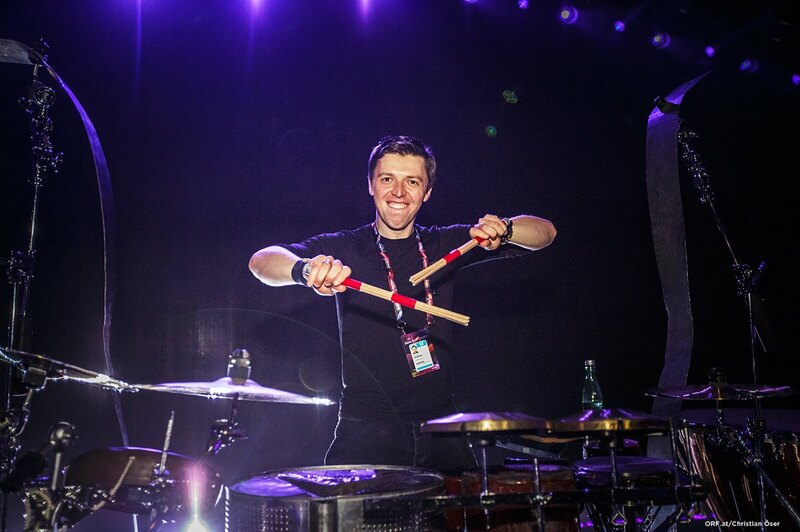 Star-percussionist Martin Grubinger has designed a specially tailored to the ESC 2015 work that combines big band and classical music, choral singing and percussion into a harmonious symbiosis. In the nine-minute interval act are involved nearly 40 instrumentalists and the Arnold Schoenberg Choir, conducted by Erwin Ortner and Ebenseer Glöckler. Visual implementation of the interval act is based on the slogan "Building Bridges". Combining brass instruments and choral voices, forming couples of participating nations (Armenia to Finland, Poland to Australia etc), a formation that will eventually be picked up by the viewers in Stadthalle. The LEOPOLD MUSEUM presents an undisputed art highlight in the run-up to the 60th Eurovision Song Contest. 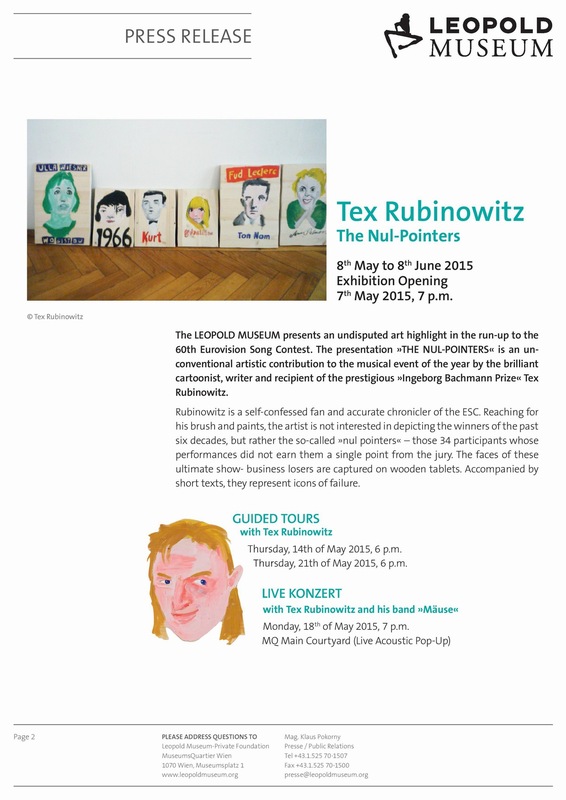 The presentation "THE NUL-POINTERS" opened today, is an unconventional artistic contribution to the musical event of the year by the brilliant cartoonist, writer and recipient of the prestigious “Ingeborg Bachmann Prize” Tex Rubinowitz. Rubinowitz is a self-confessed fan of the Song Contest. Reaching for his brush and paints, the artist is not interested in depicting the winners, but rather the so-called "nul pointers" – those 34 Song Contest participants whose performances did not earn them a single point from the jury. The faces of these ultimate show-business losers are captured on wooden tablets. Accompanied by short texts, they represent icons of failure. Exhibition will be open till June 8. The Leopold Museum is open daily from 10-18 clock, on Thursday from 10-21 clock. On Tuesdays, the museum is closed. Every participating Eurovision nation has local supporters among Vienna resudents. Municipal statistics shows that there are people born in all 40 of participating countries now living in Vienna. The fan base for San Marino is rather limited though, only one person born in it lives now in Vienna. 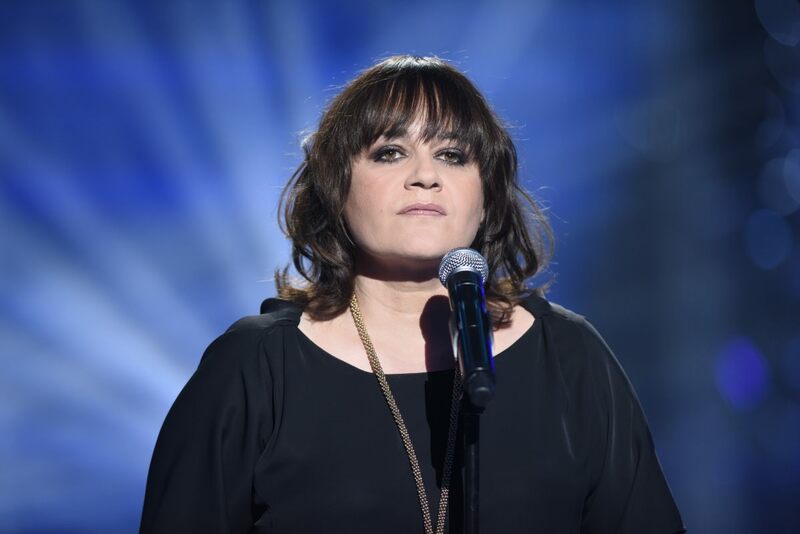 In contrast, the Serbian singer Bojana Stamenov may hope for broad support, because 82 725 people from her country have chosen Vienna as a place of residence. This makes them the largest fan base is an immigrant background. In the most livable city in the world there are also 45 434 Germans, and there are also 43 569 people with Polish roots. Even Guy Sebastian from Down Under can count on support of 801 compatriots who live in Vienna. There are 15 184 people born in Russia living in Vienna, which puts Russia on 6th place after Serbia, Germany, Poland, Romania and Hungary, thus Russian entrant Polina Gagarina can also hope for high points from Austria. Georg Obermeier, General Manager Microsoft Austria, Hannes Ametsreiter, CEO of A1 and Telekom Austria Group and Michael Götzhaber, director of technology, Online and New Media at ORF have presented today 800 Lumia 535 smartphones with A1 SIM cards to the volunteers of the Eurovision Song Contest in the Wiener Stadthalle. The smartphones have been also equipped with a special app providing latest information on the event, while any changes in the daily routine or security-related messages can be sent via push notification within a short time. The timetable of the Wiener Linien, plans of the Stadthalle, local tips, information about side events or taxi and emergency telephone numbers are included. 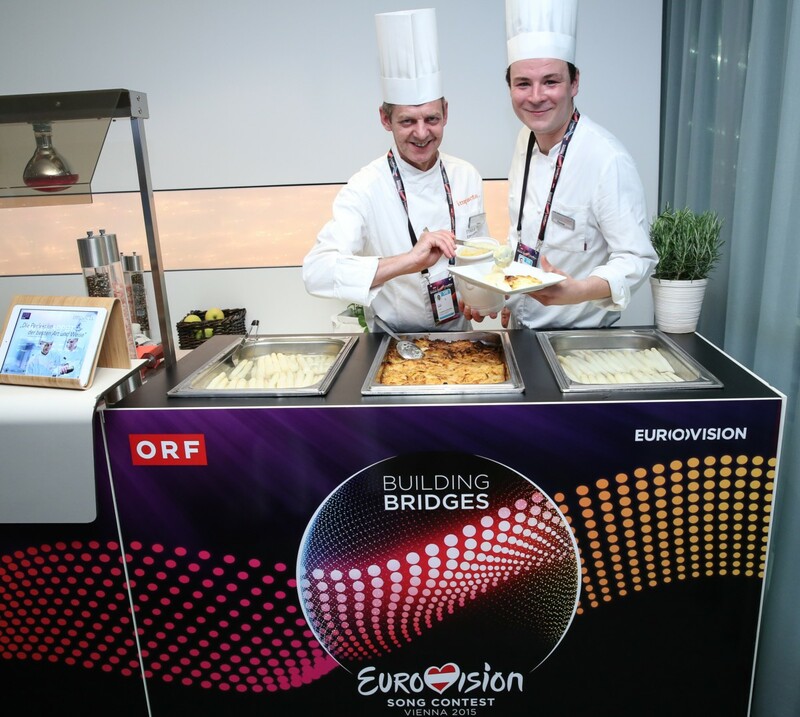 Company impacts Catering, certified with the Austrian eco-label, will be responsible for the catering of accredited delegation members, press and VIP guests at the Eurovision 2015, while Gourmet Catering will be responsible for the crew and audience catering. On Wednesday 6th of May ESC Executive Producer Edgar Böhm and impacts CEO Christian Chytil have organized presentation and tasted menus for the international guests in the Wiener Stadthalle. Edgar Böhm said: "I'm really proud that we are to make Eurovision Song Contest for the first time in history as a Green Event. The food plays an important role, and we are pleased that we can offer such an attractive as sustainable dining experience". Guests of Wiener Stadthalle will embark on a culinary journey through Austria: The catering will offer the diversity and high quality of Austrian products - from the original Wiener Schnitzel, to the Vorarlberg cheese noodles, with great emphasis placed on sustainable and Austrian production. "A total of more than 30 percent of foods are guaranteed organic, for an event of this magnitude it is an excellent level," said BIO AUSTRIA board member Arthur Alexander Schmid. "Especially with food from organic farming Austria is in the lead, and the ESC is a great opportunity to showcase it to the world". Specially attention is also paid to regionality. 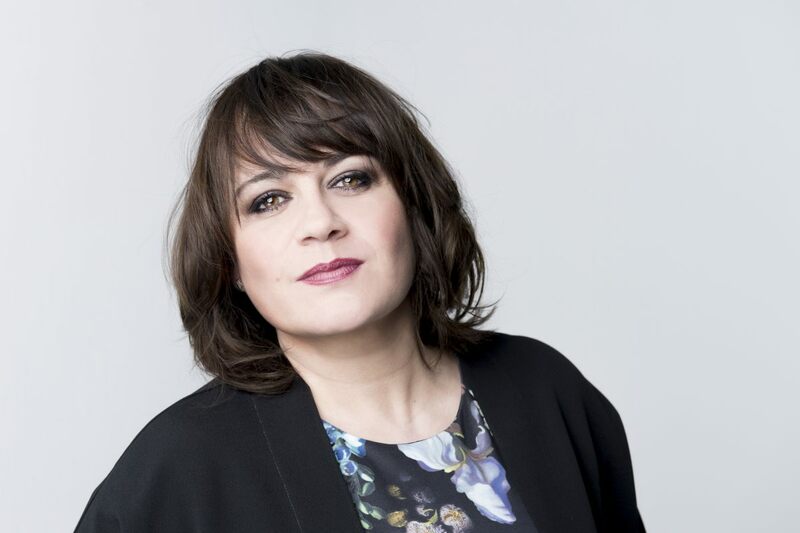 "The ESC is a great opportunity to bring the Austria's smallest region, at least for a short time in front of the curtain and to present it all over the world", said Margareta Reichsthaler, chairwoman of the GOURMET REGION AUSTRIA. Among the offers will be special Austrian fish and wines from region of Burgenland. For the refreshments in press-center will be offered free of charge Vienna mountain spring water, organic tea or fresh coffee from Julius Meinl. The sweet accompaniment comes from the Viennese candy factory Manner, which will be represented with their Manner Original Neapolitan Wafers. From Austrian nibbler experts Kelly's come salty snacks. A special highlight will be Landhof Extra without meat - the first meatless alternative to traditional sausages. Almdudler will be serving guests with the official ESC 2015 drink AlmHugo - Almdudler mixed with some mineral water, mint leaves and a dash of elderflower syrup. Champagne comes from the traditional Viennese company Schlumberger. The Ottakringer brewery supplies including the international guests with the specially brewed "The Makemakes - Das Bier". The 60th Eurovison Song Contest won't pass without a trace at the Vienna underworld as well. Six manhole covers on the Vienna channel have been converted into speakers. 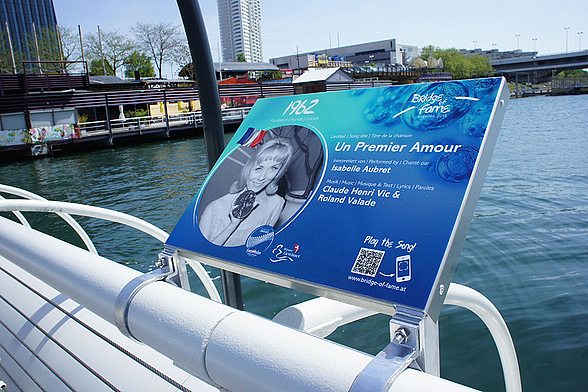 From 6 to 23 May 2015 from the manhole covers at the pedestrian areas and crowded places one will be able to hear sounds of the Austrian winning songs "Merci Chérie" and "Rise Like A Phoenix", as well as "I'm Yours", 2015 Eurovision entry. The project has been launched today by Environment Councillor Ulli Sima. Find more about the locations of the singing manhole covers at kanalquiz.at and get a chance of winning special prizes, including trip to Eurovision Song Contest 2016. Vienna is also offering "Third Man Tour" - exiting chance to meet the Vienna underworld, Vienna sewers which is Europe's most modern wastewater system. 2400 km sewer network pass right under your feet and forms a city under the city with a very special mystical flair. Since then, it is not surprising that Vienna Underworld already was used as filming location of many films and music videos. The most famous movie is certainly "The Third Man". In the Eurovision week, from 18 to 24 May 2015, the guided tour will be offered every hour from 10 to 20 o'clock. The guides can be booked online at www.drittemanntour.at. 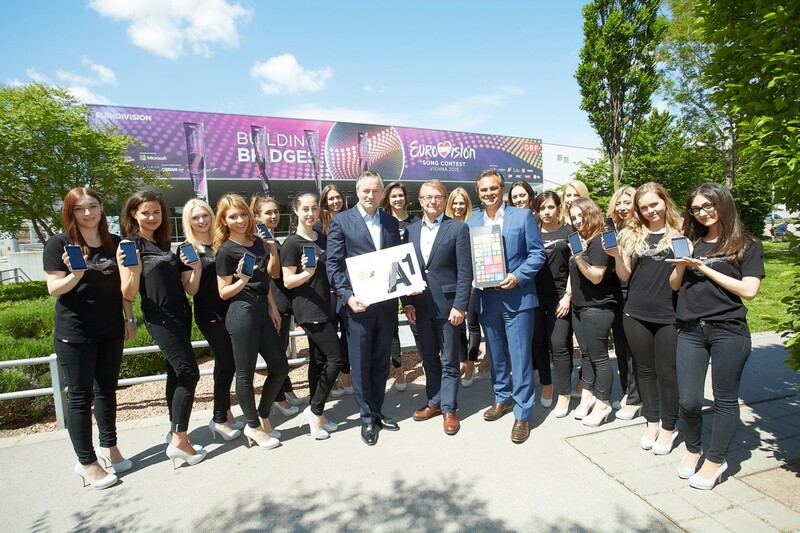 The most sought-after plastic card in Vienna now is no doubts official Eurovision accreditation badge, allowing access to Wiener Stadthalle and other Eurovision spots. 7,000 badges have been produced for journalists, delegations and fans. Delegation accreditations include: D1 (max 3) - senior delegation members: Head of Delegation, Assistant Head of Delegation and Head of Press; D2 (max 3) - commentators and assistants; D3 (max 6) - artists/stage performers; D4 (max 7) - delegates with access to the backstage: stylists, hairdressers, costume assistants, managers; D5 (max 13) - delegates without access to the backstage; D6 (max 3) - video/audio crew with access to backstage (escorted by D1); DV (max 3) - VIP delegates with access to backstage (escorted by D1) - broadcaster or record company officials. So in total, delegation may include up to 38 people. Also each delegation could accredit limited number of P - certified media representatives, and F (max 10) - committed fans. In addition there are several daily accreditations and accreditations for visiting children. For the last weeks is Accreditation Manager Gunther Herzele with his team have been hard working to enter in system all the data related to 7,000 accreditations. It is important that those people have smooth access to various areas of Arena without being stopped by security employees. The entire hall is divided into different zones, indicated by the accreditation category. Different categories can access the stage, backstage, green room or catering area. It will be difficult to overlook the accreditation center - the huge sign is already located at the entrance to the Wiener Stadthalle. Herzele is assisted in his work with a team of 15 volunteers, who will have to cope with the huge rush awaiting them. "We expect attendance of 300 people per day, and a total of 1725 press accreditations and 385 fan accreditations are ready to be collected", says Herzele. Last cards will be printed on May 23 at 21.00. Andreas Fink is responsible for preparation of the official bags with Eurovision goodies for the delegations and other accredited people. Already 5,000 bags are awaiting their owners. 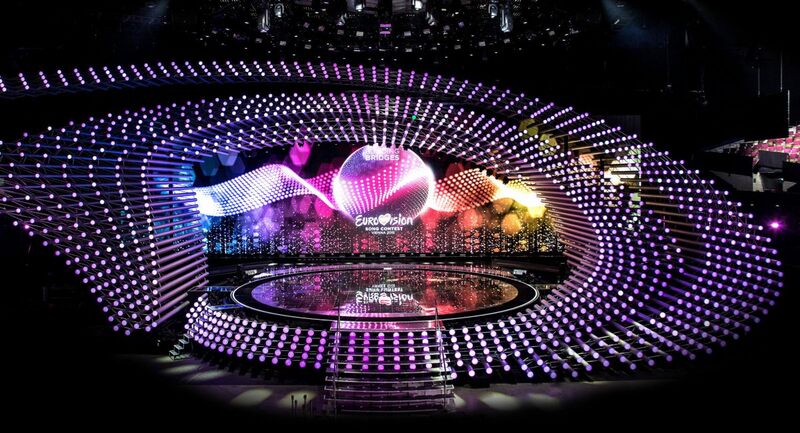 Eurovision Song Contest 2015 will be the largest television production in the history of the Austrian national broadcaster ORF. There are approximately 3,500 tons of materials used, more than 180 kilometers of cable and more than 800 employees in total involved, of which around 300 are making the technical core. The TV compound, the heart of TV production, in addition to sound and transmission vehicles covers around 40 containers for production technology equipment and office capacities. Two ultra-modern OB vans ensure perfect HDTV images in transfers - total 26 cameras of all kinds will be providing images from the shows: Standard cameras and mobile cameras with wireless systems, steadicams which allow a dynamic movement, mini cameras in the decoration, rail and cable systems, as well as a "Spidercam" and for the first time in Europe a "JitaCam" - an extendable camera crane that hangs from the ceiling. 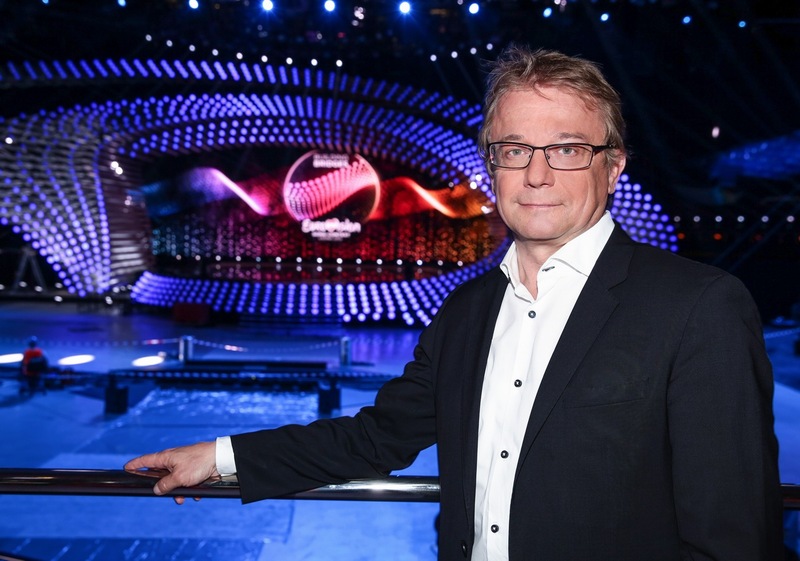 Two ORF own Soundmobile systems will allow the best Dolby 5.1 audio sound to make the "Eurovision Song Contest" "state of the art" in audio experience. Around 60 wireless microphones and more than 120 in-ear receivers are used as well as a sound system with eight consoles for about 160 speakers on stage and in the hall. With around 1,400 lights and nearly 1,300 light steles are making an impressive lighting design for the live show. In the implementation of the concept of lighting more than 200 m of Alu Truss scaffolding systems were used. In the back of the stage, the largest LED wall of ​​315 square meters was installed. Combined with 12 HD large-screen projectors and a LED total area of ​​approximately 500 square meters, the show is becoming the impressive multimedia event. The basis for a smooth process is a properly functioning communication concept. 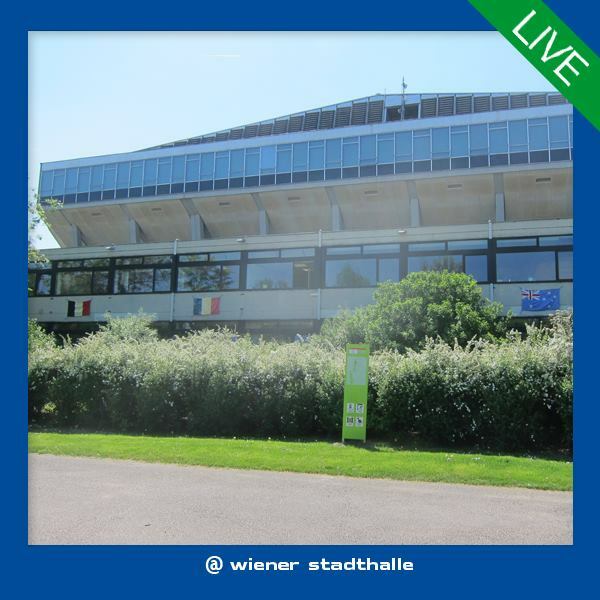 For this purpose, more than 550 radios are using own separate wireless network inside Stadthalle. All stationary technical facilities are divided into several intercom rings and overall comprise over 150 individual stations. With the services provided by Microsoft Azure cloud platform, an optimal file transfer between the ORF editorial staff and the delegations can be done via the application Yammer in the shortest and efficient way transmitted simultaneously to several hundred crew members via push notification. 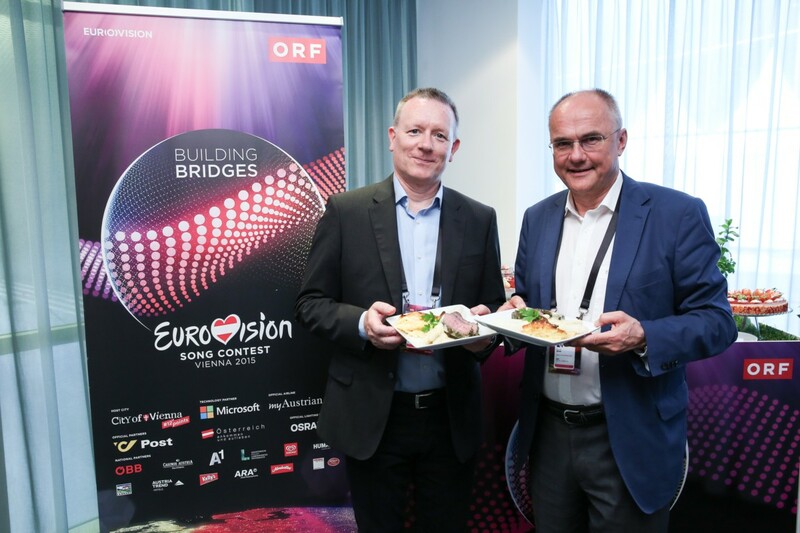 Michael Götzhaber, director of technology, Online and New Media of the ORF: "The ESC 2015 is a great task and a major challenge for the whole team of the ORF. We work with the highest commitment on making the Song Contest for an unforgettable viewing experience for our audience". In addition to the city branding of the City of Vienna, Airbus A320 of Austrian Airlines, ESC trams of Wiener Linien, two ESC locmotives of ÖBB, the countdown tower at the Rathausplatz, and the branding of Wiener Stadthalle, famous UNIQA Tower in Vienna will be getting in Eurovision look every night from 3 to 24 of May. The project was launched yesterday by Richard Grasl, Commercial Director of ORF, and Andreas Brandstetter, CEO of the UNIQA Insurance Group AG. More than 7,000-square-meter façade area of ​​the UNIQA Tower will be covered with the design of the "Eurovision Song Contest". 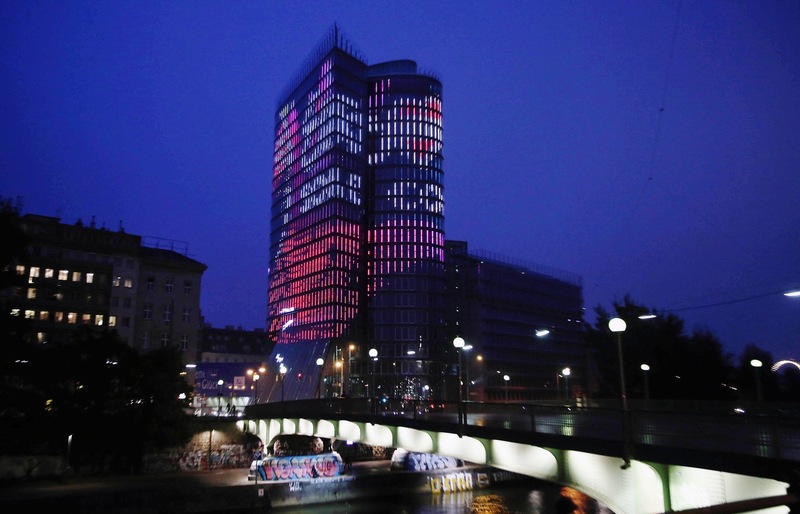 The lighting installation consists of more than 40,000 pixels, 160,000 individual LEDs are integrated at the window facade of the UNIQA Tower. The Tower is located at Aspernbrückengasse in Wien Leopoldstadt, second district of Vienna. 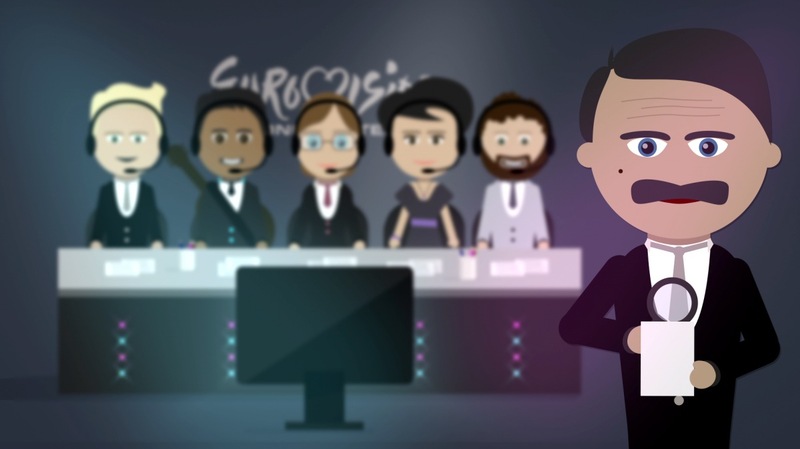 Since 2009, the outcome of the Eurovision Song Contest is determined not only by televiewers from around Europe - but also by music industry professionals. In each country, viewers and a national jury both make up 50 percent of the outcome of the contest. 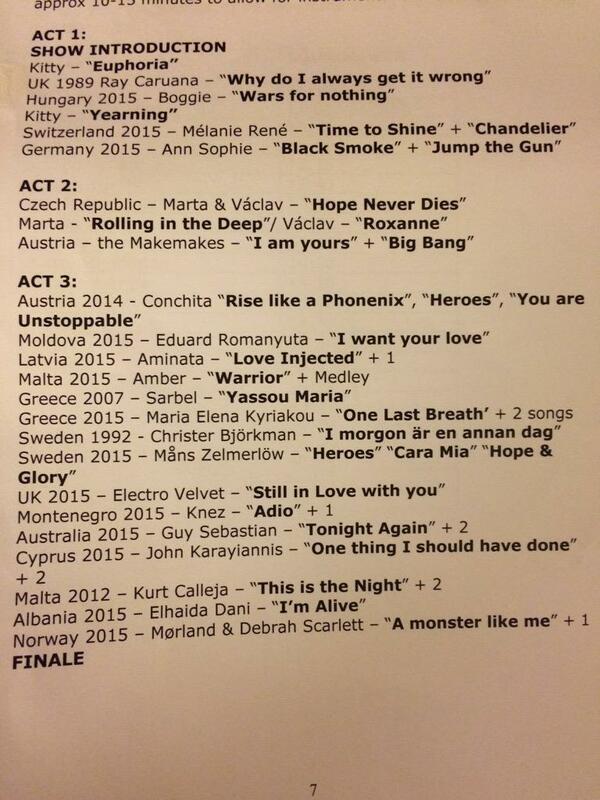 EBU has revealed today preliminary list of jurors that you can check here. 106 jury members are female, 132 are male, 2 are still missing (Albania and Switzerland juries are not yet approved). Aram MP3 from Armenia (2014), Gary Lux (1985 & 1987) and Manuel Ortega (2002) from Austria, Roberto Bellarosa (2013) and Witloof Bay-member Florance Huby from Belgium (2011), Søren Poppe from Rollo & King (2001) and Lotte Feder from Kenny & Lotte (1992) from Denmark, Tanja from Estonia (2014), Marie Myriam from France (1977), Sophie Gelovani & Nodi Tatishvili from Georgia (2013), Marianna Efstratiou from Greece (1989 & 1996), Ryan Dolan from Ireland (2013), Margaret Berger from Norway (2013), Donatan & Cleo from Poland (2014), Adelaide Ferreira (1985) and Inês Santos (1998) from Portugal, Ovi from Romania (2010 & 2014), Alsou from Russia (2000, also host in 2009), Dina Garipova from Russia (2013), Nevena from the group Moje Tri(2013 and Junior Eurovision Song Contest in 2007) and Marko Kon (2009) from Serbia, Tinkara Kovac from Slovenia (2014), Rosa Lopéz (2002), Dani Diges (2010), Pastora Soler (2012) and Ruth Lorenzo (2014) from Spain, Hind Laroussi from The Netherlands (2008) and Gabriel from the band Sinplus from Switzerland (2012), Birgitta Haukdal (Iceland 2003), Liora (Israel 1995), Ralfs Eilands (part of PeR, Latvia 2013), Geta Burlacu (Moldova 2008), Michal Wisniewski (Ich Troje, Poland 2003 and 2006), Nicola della Valle (San Marino 2008). The list also contains several former backing vocalists, song writers, composers, producers and choreographers who have been involved with past Eurovision Song Contest entries. Traditionally, the jury members will come together to watch the second Dress Rehearsal of each show live as it happens via a dedicated satellite channel at each country's public broadcaster headquarters. 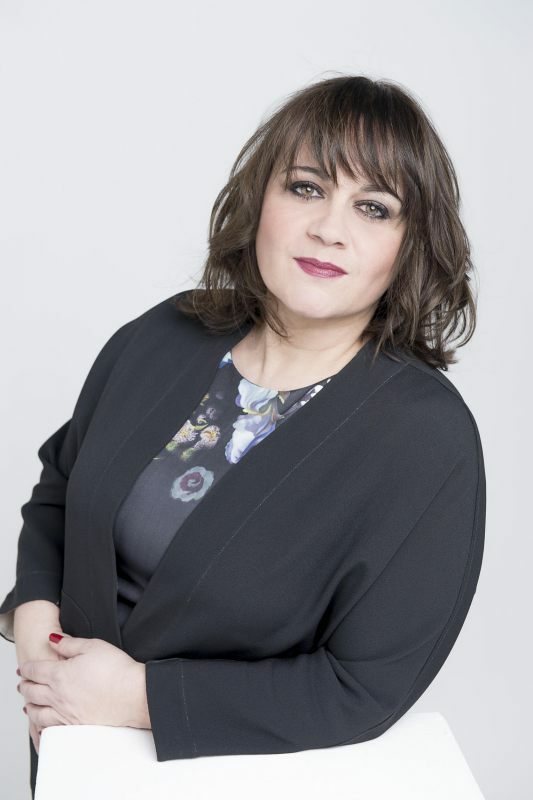 Their work will be supervised by a notary, and the EBU's independent observers of PwC reserve the rights to pay ad-hoc surprise visits to the jury gatherings in order to re-assure that the jury voting is being conducted in accordance with the Rules of the Eurovision Song Contest. Each jury member is asked to evaluate the composition, the performance, the overall act and the song's hit potential, and rank all entries, except their own country's contribution, in order. Each jury member should vote independently from the others. After their submission, the EBU and PwC intensely work to check and verify the jury rankings. In case of apparent irregularities, a national jury vote may be discarded. The jury ranking is then combined with the ranking of the televote, on the night of the live show. In the unlikely case of problems with the televoting result, the EBU Executive Supervisor will decide to only use a country's jury vote. No member of a jury shall be connected in any way with any of the participating songs entered and/or artists performing in the contest in such a way that they cannot vote in complete independence and impartiality. Just like viewers at home, juries will vote during the Final and during one of the two Semi-Finals. Our next guest is the representative of France Lisa Angell. We have met her in Amsterdam for a short video interview, and now have the opportunity to get more in-depth information on her entry and preparations. At the Song Contest Lisa will be performing "N'Oubliez Pas", which she describes as "a message of peace, hope, and optimism". 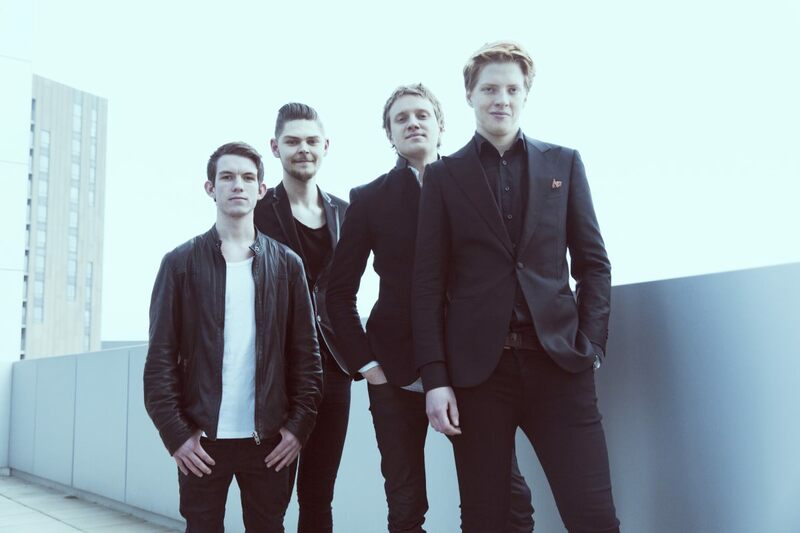 "Since September 2014, I have been recording demos of my future album. A lot of songwriters send me songs, and I got one from Robert Goldman, "N'oubliez pas" ("Don't forget"). It was in October. This sons rings a bell in my mind, because it completely echoes what I think and feel. A few months before, I watched a documentary on World War 1, and I found that the lyrics of the songs were very accurate. So I decided to give it a try and to record a demo. I arranged it with my team, I met Robert in the studio, and we instantly got along very well. He's a great guy, I really like him. The song was recorded". "On the 17th of November, I was on stage at La Madeleine. My producer, Jean-Claude Camus, who was in charge of the production of my album, suggested me to sing "N'oubliez pas". I was ready to share my new project with my audience by offering them the very first song of the upcoming album. I sang it, and it was terrific. Then it were Robert Goldman and Jean-Claude Camus who submitted the song to France Télévisions. And in January, I received a call from Franck who told me that France Télévisions really liked it, and that they had even decided that we were going to represent France at the Eurovision with this song this year. I say "we" because I'm sharing this amazing experience with Robert Goldman". "First, I thought it was a joke. And when my manager told me it was true, I felt like the lottery winner. And I whooped of delight. Can you imagine? When you have been dreaming about this since you are 7, and that thirty years later you are announced that it's truly you who will do it this year! It's a gift. I am a fulfilled woman and I enjoy it everyday". Lisa says she is completely happy with the song as it is right now, and there are no plans to release it in languages besides French. "It is a beautiful language, who often carries suffering people". She explains that there will be some clues in the staging, so that everybody understands the message, even those who don't speak French. "I received lots of messages through my Facebook page, from Azerbaijan, Armenia and Romania, and they got it, they understood the song. I believe in an artist's authenticity. I think that when you work hard on your songs, when you are into your lyrics, you can share emotions with your eyes, your body, so I think I will be understood. In piano-bars, there were people from everywhere. I also sang French songs in China, everybody understood, not vocabulary-speaking but there is a vocal performance, an attitude, and when you perform, emotions can be seen. Feelings are out. When you don't feel good, when you are bored, it's visible, even if you don't say a word"
Singer describes her aim at Eurovision saying: "I expect to bring the victory back to France, or at least, to finish in a good spot! From my personal point of view, the Eurovision is a great opportunity to get my music and my art to all Europe". Last year Lisa met Conchita Wurst at "La fête de la musique". Lisa says that she found Conchita sincere and an authentic artist. "That's why I think we have a chance to win this year, because I feel close to her in a way". Two weeks ago Lisa were in Amsterdam for the Eurovision in Contest event. "It was very important for me to be here. I can meet other delegations, and begin to feel the crazy week I'll live in Vienna!". French entrant says she tried to listen to each and every song. "I personally love the Voice of the Australian participant, and I think Italians have a great song!". Currently she is busy with preparations for the event: "I rehearse a lot with my coach,and I do a lot of yoga in order to channel my energy and release it the best way the D-Day!". Lisa says that Nathalie Noennec is in charge of her outfit for the contest and image in collaboration with France TV. "I can't tell you a lot about stage direction, just my stage director is named Rabah", she adds. Lisa also has been working on her album to be released on May 11. "It's an self-titled record. He will normally be out on May, 11th with SMART/Sony Music, he's only composed of exclusive songs this time. I'm very proud of it because I worked with writers and composers I admire for a long time and who have the same passion for music as I do. We shared this passion on this record, and we put everything we have in it. I'm really proud of it, and I can't wait for you to discover it". Lisa's biography mentions that once she has been performing in Moscow in packed Luzhniki stadium. A lot of Russian fans were interested in the details of this performance. "It was a private event, the organizer heard about me and invited me to the show. There was a lot of artists, I was very well welcomed. I sang "Quand on fait l'amour" and the audience responded very well!". "I can't wait to sing "N'oubliez pas" for you, and I really hope you will love it and understand its message. Thanks for your support! You can also read text version of this interview on OGAE Rest of the World Facebook page. 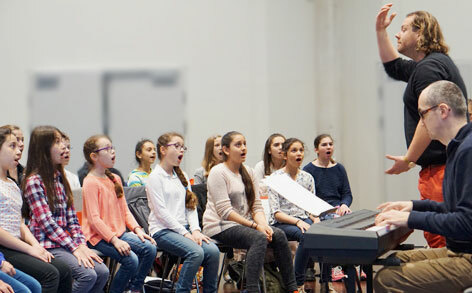 As we have reported earlier, true to the theme of “Building Bridges”, the Eurovision Song Contest in Austria and the Vienna State opera organize on Sunday the 17th of May from 12.00 to 13.30 to a performance at which the artists and their music will bridge different genres and cultures: “Pop Meets Opera” at its best. Guests can experience an extraordinary and unique performance in which international classical music stars and representatives of pop music join on a world-renowned opera stage. A concert with global guest stars such as Alessio Arduini (Italy), Daniela Fally (Austria), KS Juan Diego Flórez (Peru/Austria), Aida Garifullina (Russia), Valentina Naforniţă (Moldova), KS Herwig Pecoraro and his son Mario Pecoraro (Austria), solo dancer from State Ballet of Vienna Ioanna Avraam (Cyprus) and The Philharmonics (an ensemble of musicians from the State Opera Orchestra / Vienna Philharmonic), the Wiener Comedian Harmonists (consisting of members of the chorus of Vienna State Opera). KS Plácido Domingo, unfortunately, had to cancel his appearance due to the illness. The Eurovision Song Contest will be represented by Boggie (Hungary), John Karayiannis (Cyprus), Morland & Debrah Scarlett (Norway), Molly Sterling (Ireland) and Nina Sublatti (Georgia). 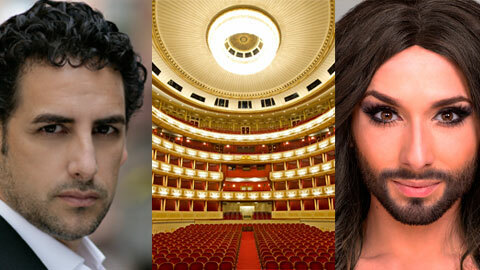 Of course, the “Queen of Austria”, ESC winner Conchita Wurst, will also do the honour. Splendid artists from pop and classical music join for a celebration of music, in an unprecedented event. Moderation is by ORF’s cultural expert, Barbara Rett. “Pop Meets Opera” will be broadcast on ORF III on Sunday, 17 May 2015 at 8.15pm on the program “Erlebnis Bühne”; it will also be live streamed worldwide free of charge via the portal www.staatsoperlive.com and, within the context of “Opera Live on the Square”, at Herbert von Karajan-Platz - directly in front of the Vienna State Opera. 17. Encore – all artists - Libiamo ne’ lieti calici from La traviata by Giuseppe Verdi. Tickets for the show are being sold for 7 - 60 Euros and can be purchased online here. The "Bridge of Fame" was officially launched by Environment Councillor Ulli Sima today at the New Danube. It is completely renowated 190 m long "Copa-Steg" connection between mainland Vienna and Danube Island. 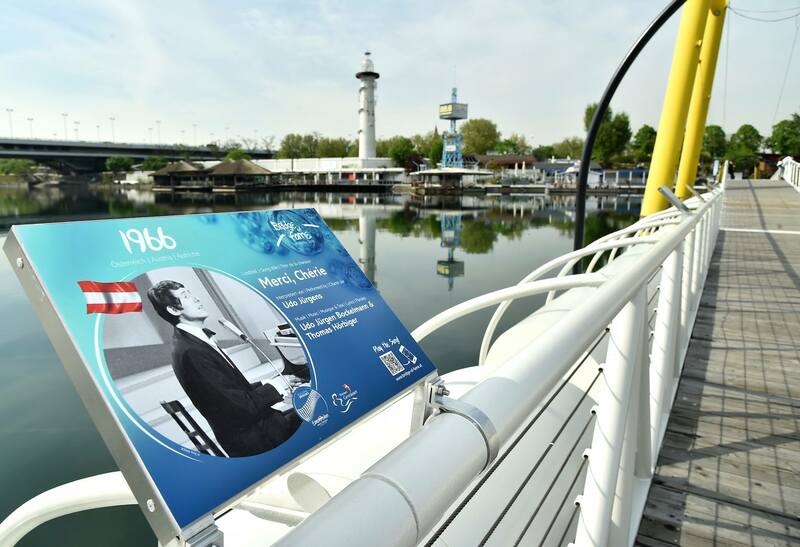 The Municipal Department 45 (Water Management) jumped at the occasion, using the Eurovision Song Contest and its motto “Building Bridges” to give the bridge, which was due for refurbishment, a Song-Contest-related theme. All surfaces, such as buoyant elements, illuminating arches, hand rails, etc. have not only been freshly primed and painted but have also received a music-themed design. Sixty plates show information about all the winning acts; you can use your mobile phone to scan the accompanying QR codes and directly go to the according song. "I'm pleased with the new design of the bridge in the top-recreational paradise of Vienna. 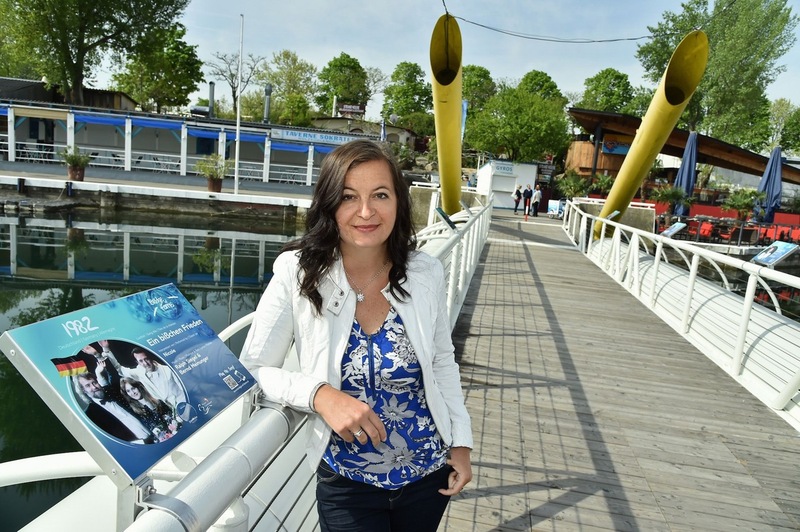 The motto 'Building Bridges' is even more appropriate here on the Danube Island and I hope that many people will take a journey through 60 years of Song Contest", said Environment Councillor Ulli Sima. The “Bridge of Fame” (a.k.a. Copa-Steg, a.k.a. Ponte Cagrana) can easily be reached via the U1 metro, stop “Donauinsel”. You can also do a virtual tour on the bridge on it's website. BTRC and metropolitan karaoke club "Sinatra" have organized official farewell party "Uzari & Maimuna invite friends". Before the trip to Vienna Belarusian popular artists, media persons, sports stars, celebrities and journalists came to give their best wishes to the duet. Among invited guests was also ESCKAZ.com with the team lead by Evgeny Nikolayev (producer of exclusive content & photographer) and Dzmitry Sapsai (videographer). The party was held in the format of a karaoke battle. Guests have heard the most incredible versions of songs from the repertoire of other performers performed by the popular Belarusian artists. The event was attended by Uzari & Maimuna, their team members Denis Lis and Artyom Akhpash, previous entrants Teo and Alyona Lanskaya, national final participants band Napoli, Alexey Gross, Irina Dorofeeva, Aura and Evgeny Oleinik, band Muzzart, Anastasiya Malashkevich, "Beatris", Vitaly Voronko, current and former heads of national selection Olga Schlager and Alexander Tikhanovich and other celebrities: Iskui Abalyan, Vitaly Novikov, Vasiliy Rainchik, Alexey Khlestov, Marina Curry, Alesya Boyarskikh, Ksenia Baranovskaya, Barbara and Eduardo, Olga Tunik, Elena Spiridovich, Svetlana Borovskaya and others. We present you the videos of performances of Uzari & Maimuna, their team member Denis Lis, Uzari's mother Galina Gromovich, Maimuna's husband Andrey Murashko, Teo, Alexey Gross as well as other highlights of the party. More photos from ORF shooting of the postcards revealed. Albania - Elhaida Dani met the steep slopes on exciting ways in Vorarlberg winter landscape. Armenia - Genealogy got to know the iridescent side of the city of Vienna experienced a boisterous day of fun and action. Austria - The Makemakes got to know the Austrian countryside in Lower Styria on a previously unknown way. Australia - In the historic city of Salzburg, he discovers a piece of home and will be introduced to Austrian art of water sports. Belgium - Loic Nottet in Eisenstadt brought surprising momentum for the romantic city and its passersbys. Cyprus - John Karayiannis had a fun on water at Neusiedlersee in Burgenland. 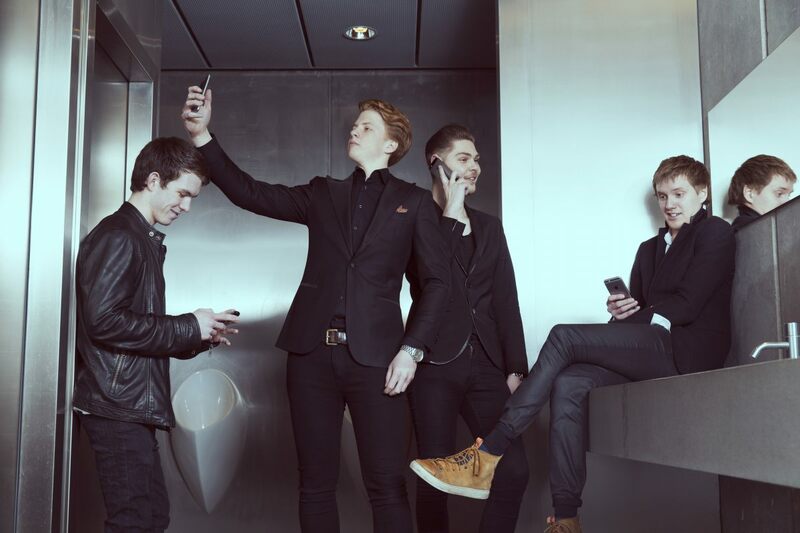 Denmark - Anti Social Media filmed the postcard at the mountain landscape of Tyrol getting into a thrilling race. Estonia - Elina & Stig practiced a new trend sport in Mattsee in Salzburg. Finland - Pertti Kurikan Nimipäivät visited Vienna Tram Museum and an old carriage house, getting unique experience. Georgia - Nina Sublatti together with the famous Austrian fashion designer Lena Hoschek dives into the world of exquisite materials and experiences a touch of nostalgia in Graz. Germany - Ann Sophie in Vienna discovered an exciting combination of sports and the latest technology. Hungary - Boggie had a day full of action at Lower Austrian Fire Service College in Tulln. 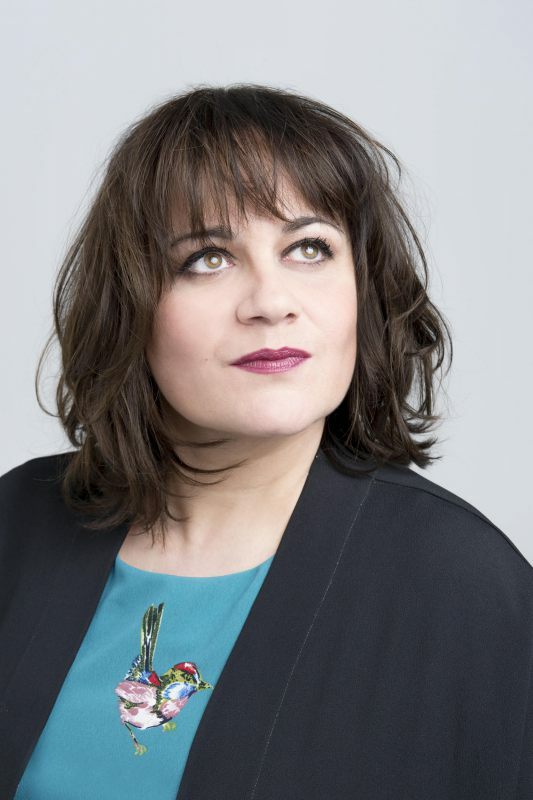 Iceland - Maria Olafs was invited to Vienna Burgtheater to meet actor Markus Meyer and to take on a different role on one of the most important stages in Europe. Ireland - Molly Sterling - in the unspoilt nature of Jois she gets to know her passion in a different light. Lithuania - Monika & Vaidas dream came true in Carinthia Jauntal. Malta - Amber raised to the new heights at Zell am See and enjoyed the unique view of the stunning scenery of Salzburg. Moldova - Eduard Romanyuta was received warmly in Franking by the members of the Upper Austrian Rural Youth Group and took part in a traditional and tought race. Montenegro - Knez got introduced in a special way to the Austrian cuisine in Grundlsee surrounded by the stunning landscape of Styria. The Netherlands - Trijntje Oosterhuis experienced exciting day in Kagenfurt and saw the famous Wörthersee from a completely new perspective. Norway - Morland & Debrah Scarlett took the helm in hand in the beautiful scenery of Altaussee in the Styrian Salzkammergut. Poland - Monika Kuszynska was introduced into the high art of the imperial tradition of pastry shop Demel. Portugal - Leonor Andrade was surrounded by overwhelming scenery in the idyllic wine region of Wachau and discovered unexpected skills. Romania - Voltaj competed in a traditional sport of Lower Austria. Russia - Polina Gagarina confronted in Wattens her fear of heights in order to participate in the completion of an impressively large artwork. Serbia - Bojana Stamenov was invited to Burgenland in Burgenland, where she could put her special dexterity to the test in a traditional handicraft operation. Slovenia - Maraaya got to know the horses up close in Styria. UK - Electro Velvet supported by the latest technology sprayed in Linz a touch of magic and spells. 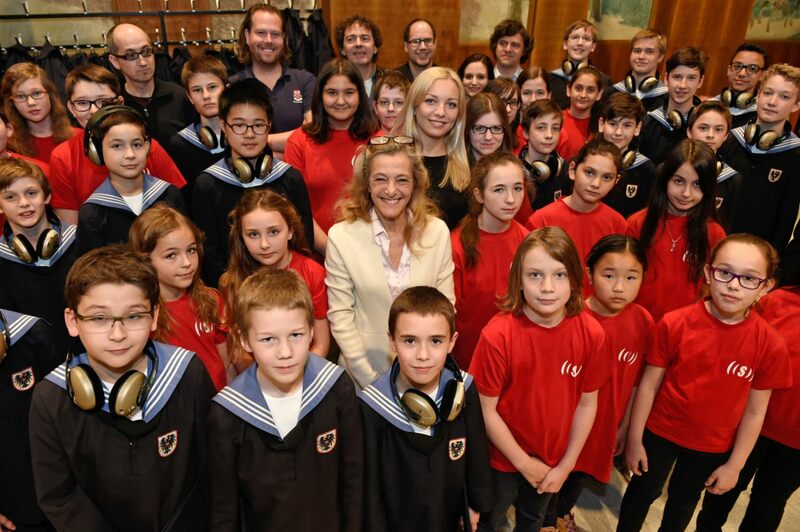 The Vienna Philharmonic, Vienna Boys' Choir, Suparar Choir, Lidia Baich, Conchita Wurst, Left Boy and the RSO will open the Grand Final of the 2015 Eurovision Song Contest in Vienna. The Vienna Philharmonic Orchestra opens the show from the garden of Schönbrunn Palace. Viewers from Georgia to Iceland, Norway to Australia head out to a cinematic journey through the most beautiful cities and landscapes in Austria to the Wiener Stadthalle, to see the star-violinist Lidia Baich with a snippet from the very first Austrian Eurovision Song Contest winning song "Merci Chérie". Immediately afterwards, Conchita Wurst will perform with the Vienna Boys' Choir, the multinational Superar Choir and the Austrian rapper Left Boy the official "Building Bridges" anthem. It was composed and arranged by David Bronner, Dorothee Freiberger, Kurt Pongratz on the lyrics of David Malin. They are accompanied by the ORF Radio Symphony Orchestra directed by Peter Pejtsik. In total, more than 200 artists are a part of the opening act. As the final highlight of the opening act, all the contestants will come to the stage by using a "magical bridge" through the audience. 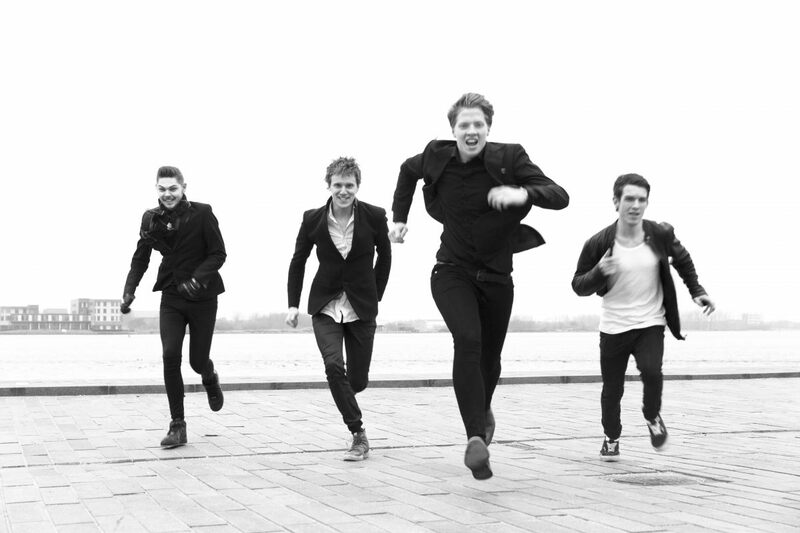 Band reveals there will be slight changes in the staging of the song, but they are meant to remain a surprise. 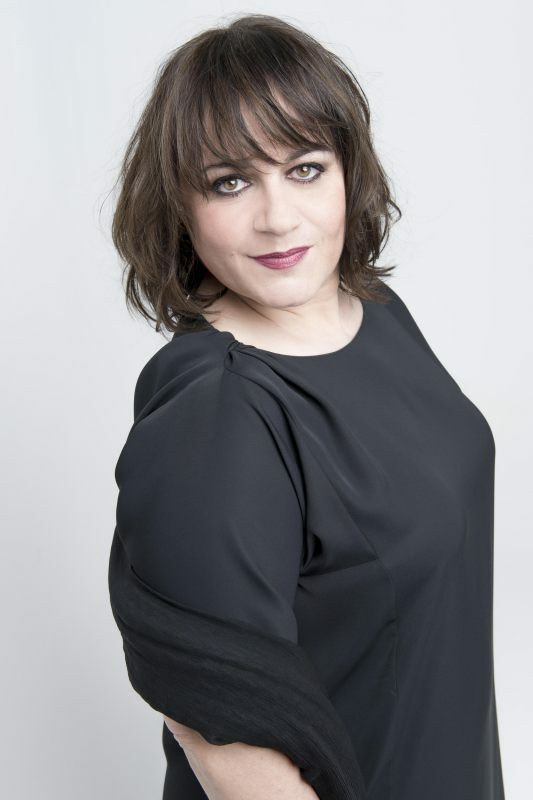 "Our two wonderful backing vocalists are Nellie Ettison and Johanna Beijbom. Johanna wasn’t on the stage with us in the Danish finals, but we have had to make some changes for the Eurovision show, and therefore we brought in the fantastic Johanna! 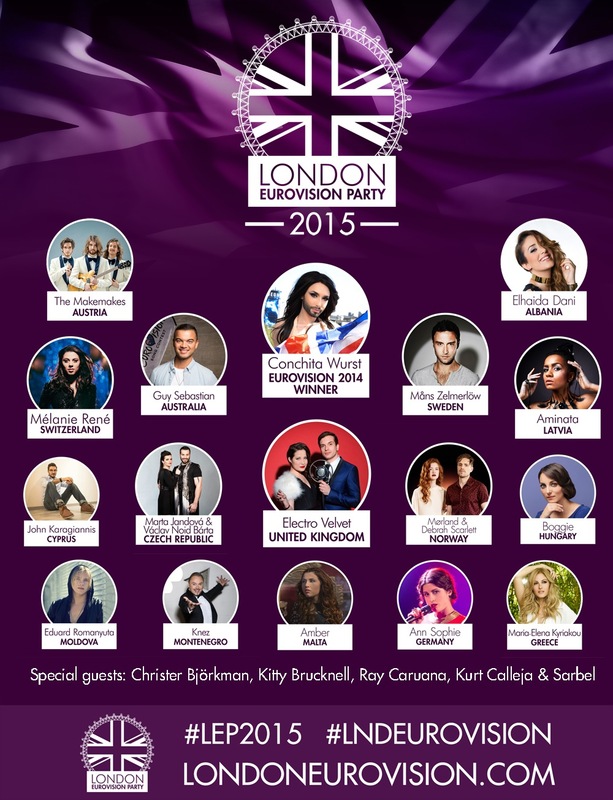 :D"
London Eurovision party is taking place today in Cafe de Paris, London, UK. As it is now tradition, the London Eurovision Party will open its doors on a Sunday for an evening of performances, catching up with friends and dancing until the early hours of the Monday. Sale of tickets for the show will be launched on 14 February. Ray Caruana - Why Do I Always Get It Wrong? and former BBC Eurovision commentator Paddy O'Connel. Девиз ESCKAZ - "Узнайте новости Евровидения первыми!". Как обычно, наша команда официально аккредитована и будет сообщать вам новости Евронедели от начала и до конца во всех их подробностях. Ежедневно, с 06 по 24 мая на БЛОГЕ ESCKAZ.com ИЗ ВЕНЫ вы сможете узнать всю самую свежую информацию о конкурсе прямо их столицы Евровидения 2015: Репортажи о репетициях, пресс-конференциях участников, фанатских и других мероприятиях. Мы также постараемся держать вас в курсе событий, происходящих и за пределами пресс-центра Евровидения, арены и Евроклуба. Последние три года в дни Евронедели ESCKAZ являлся наиболее посещаемым независимым фан-сайтом, а в прошлом году наши репортажи из Копенгагена собрали свыше 4 миллионов видео просмотров. Мы постараемся держать эту высокую планку и в этом году. Не забудьте также подписаться на наш Twitter и Instagram - ваши источники самых свежих новостей. С полным расписанием мероприятий, репетиций, пресс-конференций и т.п. вы можете познакомиться в гиде ESCKAZ для Евровидения 2015. Данная страница новостей не будет обновляться на Евронеделе, потому, пожалуйста, заложите закладкой адрес нашего блога. В то время как делегации Евровидения уже с субботы начнут собираться в Вене, а с понедельника будут проходить первые репетиции в Wiener Stadthalle, пришло время подытожить подготовительный период между сезоном национальными отборов и Евронеделей и взглянуть на то, кто же является фаворитами конкурса в этом году. Букмекеры разделили свое мнение между двумя фаворитами: Италией и Швецией. Недалеко от них идут Австралия и Эстония, а в топ 7 входят и Россия с Азербайджаном. Аутсайдеры кампании в этом году: Португалия, Сан-Марино, Чехия и Швейцария. Италия и Швеция также сражаются и за победу и в голосовании фан-клубов OGAE. В пятерку также входят Эстония, Словения и Норвегия. Окончательные результаты должны быть оглашены 10 мая. Эстония возглавила два наиболее престижных онлайн-голосования: на ESCStats она обошла Италию и Швецию, а на ESCNation - Швецию и Словению. С небольшим отставанием она уступила России на собственном голосовании ESCKAZ, а за ними вновь выстроились Швеция и Италия. Планируется, что команда ESCKAZ запишет свой видеообзор участвующих песен на английском языке 10 мая в Вене. Музыкальный мост между прошлым и будущим, соединяющий поколения и нации между собой - такова основная тема интервал-акта финала конкурсе Евровидение 2015. Австрия представлена в нем как страна музыки, где она имеет глубокие корни, но музыкальная традиция жива и развивается и поныне. Звездный перкуссионист Мартин Грубингер создал специально для Евровидения работу, которая гармонично совмещает в себе классическую музыку и биг-бенд, хоровое пение и перкуссию. В девяти-минутном номере принимают участие около 40 инструменталистов и хор Арнольда Шёнеберга под управлением Эрвина Ортнера и Эбенсер Глёклер. Визуальная сторона номера также основывается на слогане "Возводя мосты". Сочетая духовые инструменты и хоровое пение, будут формироваться пары из участвующих стран (например Армения с Финляндией, Польша с Австралией и т.п. ), а потом эту инициативу подхватят и зрители в Штадтхалле. Leopold Museum представляет бесспорно одну из самых интересных выставок в преддверии юбилейного Евровидения. Сегодня торжественно была открыта презентация "The Nul-Pointers" - которую создал знаменитый художник, писатель, обладатель престижной премии им. Ингеборг Бахманн - Текс Рубиновиц. Рубиновиц признается в том, что давно является поклонником Евровидения. Достав свои краски и кисти, художник правда решил пойти по иному пути, и изобразить не победителей конкурса, а тех артистов, которые набирали в нем "ноль баллов" - таковых в истории набралось 34. Лица этих крупнейших лузеров в истории шоу-бизнеса были запечатляны им на деревянных полотнах. В сопровождении коротких текстовых описаний, они представляют собой иконостас неудачников. Выставка продлится до 8го июня. Leopold Museum открыт ежедневно с 10 до 18 часов, по четвергам с 10 до 21 часа, по вторникам - выходной. У каждой участвующей в Евровидении страны среди жителей Вены найдутся свои соотечественники. Муниципальная статистика сообщает, что в Вене проживают люди, родившиеся во всех 40 участвующих в Евровидении 2015 странах. Правда, фан-база Сан-Марино несколько ограничена, только один человек, родившийся в нем, в настоящее время живет в Вене. Зато представительница Сербии Бояна Стаменов может рассчитывать на поддержку 82 725 сербов, выбравших Вену в качестве своего местожительства - это наиболее крупная фан-база из диаспор. Также в городе, который регулярно признается одним из самых удобных для жизни, проживают 45 434 немца и 43 569 жителей с польскими корнями. Даже Гай Себастиан из Австралии может рассчтитывать на поддержку 801 своего соотечественника, обосновавшегося в Вене. В Вене также проживает 15 184 человека, родившихся в России, что ставит ее на 6е место после Сербии, Германии, Польши, Румынии и Венгрии, таким образом на хорошую поддержку со стороны своих соотечественников может рассчитывать и представительница этой страны Полина Гагарина. Георг Обермайер, генеральный директор компании Microsoft Austria, Ханнес Аметсрейтер, глава компании A1 и Telekom Austria Group и Михаель Гётцхабер, руководитель отдела технологии, онлайн и соц.медиа ORF вручили сегодня 800 телефонов Lumia 535 с СИМ-картами A1 волонтерам конкурса Евровидение. Смартфоны также были оснащены специальным мобильным приложением, посредством которого можно будет узнать самые свежние новости о конкурса, а любые изменения в расписании будут передаваться в виде push-обновлений. Также в приложении можно найти расписание городского транспорта Вены, планы Stadthalle, другую информацию о городе, информацию о дополнительных мероприятиях, телефоны такси и экстренных служб и т.п. Компания impacts Catering, имеющая eco-label сертификат, будет отвечать за питание аккредитованных членов делегаций, прессы и VIP гостей Евровидения 2015, а компания Gourmet Catering - за питание зрителей и сотрудников команды организаторов. Вчера, 6го мая, исполнительный продюсер Евровидения Эдгар Бём и руководитель impacts Кристиани Китиль организовали презентацию и отпробовали меню, которое будет предлгаться иностранным гостям в Wiener Stadthalle. Эдгар Бём говорит: "Я очень рад тому, что впервые в истории мы проведем Евровидение как сертифицированное "Зеленое мероприятие". Питание играет важную роль, и мы довольны тем, что сможем предложить нашим гостям также экологическую кухню". Гости Wiener Stadthalle побывают в увлекательном кулинарном путешествии через всю Австрию: столовые в зале конкурса будут предлагать широкое разнообразие и высокое качество австрийской продукции - от оригинального венского шницеля, до сырной лапши из Ворарлберга, а наибольшее внимание будет уделяться экологической и органической продукции. "Свыше 30 процентов всего предлагаемого питания является органическим, для мероприятия подобного уровня это отличный показатель," говорит член совета BIO AUSTRIA Артур Александр Шмид. "Продукция органических ферм Австрии является одной из лучших в мире, и Евровидение - это прекрасная возможность продемонстрировать это всему миру". Особое внимание также будет уделено региональной продукции. "Евровидение - это отличная возможность вывести даже самый маленький регион Австрии на короткое время на передний план и показать его всему миру", говорит Маргарита Рейхстхалер, председатель GOURMET REGION AUSTRIA. Среди предложений будет специальная австрийская рыба и вина из региона Бургенланд. В пресс-центре всем желающим будут бесплатно предложены венская горная весенняя вода, органический чай или свежий кофе Julius Meinl. Сладости будут представлены Неаполитанскими вафлями компании Manner. Компания Kelly предложит соленые закуски. Специальным пунктом в меню будет продукция компании Landhof Extra - первая альтернативна традиционным колбасам, сделанная без мяса. Компания Almdudler предложит гостям официальный напиток конкурса - AlmHuge - безалкогольную смесь традиционного Алмдудлера с минеральной водой, листьями мяты и небольшим привкусом сиропа бузины. Шампанское поставит венская компания Schlumberger. Пивная Ottakringer brewery предложит гостям специально сваренное пиво "The Makemakes - Das Bier". 60е Евровидение не пройдет незамеченным в подземном мире Вены. Шесть крышек водопроводных люков с сегодняшнего дня запели. До 23го мая крышки, расположенные в популярных пешеходных зонах, будут играть песни-победители Евровидения от Австрии "Merci Chérie" и "Rise Like A Phoenix", а также "I'm Yours", песню Евровидения 2015. Проект был запущен сегодня представителем муниципалитета по охране окружающей среды Улли Симой. Подробнее узнать о местонахождении поющих крышек люков можно на сайте kanalquiz.at. Также там у вас появится возможность выиграть различные призы, включая поездку на Евровидение 2016. Вена также предлагает посетить т.н. "Third Man Tour" - увлекательный шанс познакомиться с подземным миром Вены. Очистные сооружения Вены считаются наиболее современными в мире. Сеть сооружений общей длиной в 2400 км пролегает прямо под вашими ногами и формирует город под городом с очень мистическим наполнением. Неудивительно, что поздемный мир Вены неоднократно становился местом для съемки популярных кинофильмов или видеоклипов. Наиболее известен из них фильм "Третий человек". На неделе Евровидения с 18 по 24 мая, туры с гидами будут проводиться каждый час с 10 до 20 часов. Туры можно забронировать онлайн на сайте www.drittemanntour.at. Самая востребованная на сегодня пластиковая карточка в Вене - это без сомнения официальный аккредитационный бейдж Евровидения, позволяющий получить доступ в Wiener Stadthalle и другие конкурсные точки. Всего для делегаций, журналистов и фанатов конкурса были подготовлены 7000 бейджей. Уровни аккредитации делегаций включают в себя: D1 (макс. 3) - самые важные члены делегации: Глава делегации, его помощник и Глава прессы ; D2 (макс. 3) - комментаторы и их помощники; D3 (макс. 6) - артисты/сценические исполнители; D4 (макс. 7) - члены делегаций с доступом в закулисную зону: стилисты, визажисты, помощники по костюмам, менеджеры; D5 (макс. 13) - члены делегаций без доступа в закулисную зону; D6 (макс. 3) - видео/аудио команды репортеров национального телевидения или радио с доступом в закулисную зону, только в сопровождении D1; DV (макс. 3) - VIP члены делегаций с доступом в закулисную зону, только в сопровождении D1 - официальные лица телеканалов или музыкальных лейблов. Итого, в сумме, состав делегации может включать в себя до 38 человек. Также каждая делегация имела право аккредитовать ограниченное количество представителей СМИ - аккредитация P, и до 10 поклонников конкурса - аккредитация F. Помимо того, разрешаются для выдачи несколько дневных аккредитаций, а также дневных аккредитаций для детей. Последние недели руководитель аккредитационного центра Гюнтер Херцеле и его команда усиленно работали над тем, чтобы ввести в базу данных всю информацию о 7000 аккредитованных на конкурсе лицах. Это важно для того, чтобы каждый из них получил нужный ему доступ в различные зоны Арены конкурса без постоянной проверки со стороны охранников. Вся арена поделена на несколько зон, которые соответствуют аккредитационным категориям. Разные категории имеют разный доступ на сцену, в закулисную зону, в грин-рум, пресс-центр или столовую. Аккредитационный центр будет сложным пропустить - огромный знак уже расположился на входе в Wiener Stadthalle. Херцеле в его работе помогает команда из 15 волонтеров, которым предстоит справиться с большим объемом работы. "Мы ожидаем, что ежедневно нас будут посещать около 300 человек, всего уже готовы 1725 пресс-аккредитаций и 385 фанатских аккредитаций", рассказывает Херцеле. Последние бейджи будут напечатаны 23 мая в 21:00. Андреас Финк отвечает за подготовку официальных сумок с подарками и важной информацией для аккредитованных лиц. 5000 сумок уже ждут своих владельцев. Евровидение 2015 станет самым большим телевизионным шоу в истории австрийского национального вещателя ORF. В конструкции использованы 3500 тонн материалов, свыше 180 км кабеля, задействованы свыше 800 сотрудников, из которых 300 входят в основную техническую группу. Телестудия, центр управления ТВ картинкой, кроме собственно эфирного и звукового мобильных центров управления, использует 40 контейнеров для технологического оборудования и офисов. Два ультра-современных вагончика OB обеспечат идеальное качество HDTV картинки. Всего в шоу будут задействованы 26 камер всех видов: стандартные, мобильные камеры с беспроводными системами, стедикамы для динамического движения, мини-камеры в декорациях, на рельсах и в системе кабелей, а также "Spidercam", и впервые в Европе - "JitaCam" - раздвигающийся кран, который подвешен к потолку зала. Две собственные системы Soundmobile телеканала ORF обеспечат наилучший звук Dolby 5.1 для того, чтобы сделать Евровидение продуктом мирового класса с точки зрения аудио ощущений. Задействованы 60 беспроводных микрофонов и свыше 120 ушных мониторов, а также звуковая система, включающая в себя 8 консолей с 160 колонками на сцене и в зрительном зале. 1400 ламп и 1300 световых стел создадут впечатляющий световой дизайн для шоу. В его воплощении пришлось задействовать свыше 200 метров троссов для крепления систем к потолку. Позади сцены будет размещена крупнейшая LED стена размером в 315 кв.м. Вместе с 12 HD широкоформатными проекторами и общей площадью LED примерно в 500 метров шоу также будет крупнейшим мультимедиа мероприятием. Основа для процесса - специально разработанная система коммуникаций. Для этих целей, свыше чем 550 раций используют собственную беспроводную сеть внутри Stadthalle. Все технические службы разделены на несколько интерком-групп, всего установлено 150 отдельных станций. При помощи облачных услуг от Microsoft Azure, обеспечивающей скоростной трансфер файлов между командами ORF и делегациями, а также приложения Yammer, будет возможно передавать самым быстрым и эффективным способом информацию одновременно нескольким сотням сотрудников команды при помощи push-уведомлений. Михаель Гётцхабер, директор по технологии, онлайн и соц.медиа в ORF: "Евровидение 2015 - крупнейшая задача и большой вызов для всей команды ORF. Мы работаем с полной отдачей для того, чтобы сделать Евровидение незабываемым опытом для всех наших зрителей". Помимо городского брендинга от муниципалитета Вены, Airbus A320 от Austrian Airlines, трамваев Евровидения от Wiener Liniet, двух локомотивов Евровидения от ÖBB, стеллы с отсчетом времени до конкурса на Rathausplatz, брендинга зала проведения конкурса Wiener Stadthalle, теперь и знаменитый небоскреб UNIQA Tower в Вене будет перекрашиваться в цвета Евровидения каждую ночь с 3го по 24е мая. Проект вчера был торжественно открыт Рихардом Граслом, коммерческим директором ORF и Андреасом Брандстеттером, руководителем UNIQA Insurance Group AG. Свыше чем 7000 квадратных метров фасада UNIQA Tower будут покрыты дизайном конкурса Евровидение. Световая инсталляция составлена из 40 тысяч пикселей, 160 тысяч отдельных LED панелей, которые интегрированы в окна фасада UNIQA Tower. Небоскреб располагается по улице Aspernbrückengasse в Wien Leopoldstadt, втором районе Вены. С 2009 года результат Евровидения определяется не только телезрителями со всей Европы - но и профессионалами в области музыкальной индустрии. В каждой стране общий итог голосования складывается на 50% из голосования телезрителей и национального жюри. ЕВС сегодня опубликовал предварительный список членов жюри, с которым вы можете познакомиться здесь. 106 членов жюри - женщины, 132 - мужчины, 2 еще не объявлены (жюри в Албании и Швейцарии потому еще не утверждены). Средний их возраст на день финала - 40 лет. Двум самым младшим членам жюри по 17 лет (в Израиле и Швеции). В жюри 2 члена до 20 лет, 35 членов от 20 до 30 лет, 81 от 30 до 40 лет, 71 от 40 до 50 лет, 32 от 50 до 60 лет, 15 от 60 до 70 лет, один старше 70 лет и один старше 80 лет. Aram MP3 из Армении (2014), Gary Lux (1985 и 1987) и Manuel Ortega (2002) от Австрии, Roberto Bellarosa (2013) и член Witloof Bay Florance Huby из Бельгии (2011), Søren Poppe из Rollo & King (2001) и Lotte Feder из Kenny & Lotte (1992) от Дании, Marie Myriam от Франции (1977), Tanja от Эстонии (2014), Sophie Gelovani & Nodi Tatishvili from Georgia (2013), Marianna Efstratiou от Греции (1989 & 1996), Ryan Dolan от Ирландии (2013), Margaret Berger от Норвегии (2013), Donatan & Cleo от Польши (2014), Adelaide Ferreira (1985) и Inês Santos (1998) от Португалии, Алсу от России (2000, также ведущая в 2009), Ovi от Румынии (2010 и 2014), Дина Гарипова от России (2013), Nevena из группы Moje Tri (2013 и Детское Евровидение 2007) и Marko Kon (2009) от Сербии, Tinkara Kovac от Словении (2014), Rosa Lopéz (2002), Dani Diges (2010), Pastora Soler (2012) и Ruth Lorenzo (2014) от Испании, Hind Laroussi от Нидерландов (2008) и Gabriel из группы Sinplus от Швейцарии (2012), Birgitta Haukdal (Исландия 2003), Liora (Израиль 1995), Ralfs Eilands (PeR, Латвия 2013), Geta Burlacu (Молдова 2008), Michal Wisniewski (Ich Troje, Польша 2003 и 2006), Nicola della Valle (Сан-Марино 2008). Список также содержит ряд бывших бэк-вокалистов, авторов песен, продюсеров, хореографов и пр. кто работал с конкурсом Евровидение. Традиционно, члены жюри собираются вместе в штаб-квартире телеканала-вещателя для просмотра в прямом эфире второй генеральной репетиции каждого шоу по специально выделенному спутниковом фиду. За их работой следит нотариус, а независимые наблюдатели ЕВС или компании PwC имеют право без предварительного уведомления нанести визит на голосование жюри той или иной страны, чтобы удостовериться в том, что оно проходит в полном соответствии с правилами конкурса. Каждый жюри должен оценить композицию, ее исполнение, общий номер, и хитовый потенциал песни, и расставить всех участвующие композиции (исключая свою собственную страну) в порядке предпочтений. Каждый член жюри должен голосовать полностью независимо от других. После приема результатов, ЕВС и PwC тщательно проверяю результаты голосования жюри. В случае выявления нарушений, голосование жюри той или иной страны может быть признано недействительным. Во время шоу результаты голосования жюри объединяются вместе с телеголосованием страны. В случае возникновения каких-либо проблем с организацией телеголосования, исполнительный супервайзер конкурса может принять решение об использовании только результатов голосования национальных жюри. Ни один из членов национального жюри не может быть связан в том или ином видео с какими-либо участвующими в конкурсе песнями или артистами, что могло бы помешать ему голосовать полностью назависимо и непредвзято. Как и зрители в каждой стране, члены жюри проголосуют дважды: во время финала и одного из двух полуфиналов. Члены жюри от России: Игорь Матвиенко (председатель), Алсу, Дина Гарипова, Любовь Казарновская, Вячеслав Кулаев, Анастасия Спиридонова (резерв). Члены жюри от Беларуси: Наталья Маринова (председатель), Виталий Карпанов, Оксана Артюшевская, Алексей Гросс, Искуи Абалян, Дмитрий Карась (резерв). Наша следующая гостья - представительница Франции Лиза Анжелл. Мы встретились с ней в Амстердаме для короткого видео-интервью, а теперь получили возможность узнать более подробную информацию о ее песне и подготовке к конкурсу. На Евровидении Лиза исполнит песню "N'Oubliez Pas", которую она описывает как "посыл мира, надежды и оптимизма". "Я записывала различные демо-записи для своего предстоящего альбома. Множество авторов песен присылали мне свои композиции, и в том числе одна из них поступила от Роберта Голдмана - "N'oubliez pas" ("Не забывай"). Это было в октябре. Эта песня полностью соответствует тому, что я думаю и чувствую. За несколько месяцев до этого, я смотрела документальный фильм о Первой Мировой Войне, и мне показалось, что текст песни очень точный. Потому я решила попробовать и записать демо-версию. Аранжировку сделала моя команда, в студии я познакомилась с Робертом, и мы сразу же очень хорошо поладили. Он - отличный парень, мне он очень нравится. Так песня была записана". "17го ноября я выступала на сцене La Madeleine. Мой продюсер, Жан-Клод Камю, который отвечал за продюсирование моего альбома, предложил мне спеть "N'oubliez pas" на этом концерте. Я была уже готова поделиться своим новым проектом со слушателями, показав им первую песню из предстоящего альбома. Я спела ее, и реакция была просто ошеломляющей. Потом Роберт и Жан-Клод решили отправить песню на Телевидение Франции. И потом в январе мне позвонили с телеканала и сказали, что песня им настолько понравилась, что они решили отправить нас на конкурс Евровидение в этом году. Я говорю "мы", потому что мы разделяем это заслугу вместе с композитором Робертом Голдманом". "Прежде всего, я подумала, что это была шутка. А когда мой менеджер сказал мне, что это правда, я почувствовала себя, как будто я выиграла в лотерею. Я просто кричала от радости. Можете ли вы себе представить? Я мечтала об этом с 7 лет, и 30 лет спустя объявляют о том, что ты наконец поедешь на Евровидение! Это просто подарок. Я невероятно счастливая женщина и получаю удовольствие от жизни каждый день". Лиза говорит, что полностью довольна песней в том состоянии, как она существует сейчас, и записывать ее на каких-либо других языках, кроме французского не планируется. "Это очень красивый язык, но его носители часто подвергаются различным страданиям". Певица объясняет, что в номере для Евровидения будут заложены дополнительные ключи для понимания посыла песни даже для тех, кто не понимает французский. "Я получаю множество сообщений на свою страницу в Facebook, они приходят из Азербайджана, Армении, Румынии, и эти люди понимают мою песню. Я верю в аутентичность артиста. Я думаю, что когда ты усиленно работаешь над своей песней, сам погружаешься в ее смысл, то делишься эмоциями своими глазами, телом, поэтому я думаю, что она будет понята. В барах, где я выступала, были люди из различных стран. Я даже пела французские песни в Китае, и все понимали их смысл, даже не говоря на языке. Важно вокальное выступление, настроение, и эмоции, которые ты показываешь во время исполнения. Чувства понятны всем. Если ты чувствуешь себя плохо, тебе скучно, это все ведь заметно, даже если ты не говоришь ни слова"
Лиза описывает свою задачу на Евровидении, говоря: "Я очень рассчитываю привезти во Францию победу, или хотя бы занять очень хорошее место. С моей личной точки зрения, Евровидение - потрясающая возможность продемонстрировать свою музыку и свое искусство всей Европе". В прошлом году Лиза встретила Кончиту Вурст на съемках "La fête de la musique" и говорит, что нашла ее искренней и аутентичной исполнительницей. "Потому я и думаю, что у нас есть хорошие шансы на победу в этом году, я чувствую себя близкой к ней в каком-то смысле". Две недели назад Лиза побывала в Амстердаме на вечеринке Eurovision in Contest. "Для меня было очень важным побывать там. Я смогла встретиться с другими делегациямм, и начала ощущать ту сумашедшую неделю, которая ожидает меня в Вене!". Представительница Франции говорит, что старается слушать все участвующие песни других стран. "Мне очень нравится голос представителя Австралии, и мне кажется, что у Италии замечательная песня!". В настоящее время Лиза тщательно готовится к предстоящему выступлению: "Я очень много репетирую со своим педагогом, мы также практикуем йогу, чтобы сосредоточить мою энергию и выпустить ее всю во время выступления на финале конкурса!". Лиза говорит, что за костюм для ее выступления и имидж вообще отвечает Натали Ноеннек в сотрудничестве с Телевидением Франции. "Я пока не могу рассказать вам многое о самом номере, но режиссера моего номера зовут Рабах", добавляет она. Лиза также работала над своим новым альбомом. "Он назван моим именем. Запланировано, что он выйдет в продажу 11 мая на лейблах SMART/Sony Music, и в этот раз на него войдут только песни, эксклюзивно написанные для меня. Я очень горда этим альбомом, потому что я работала с авторами и комопзиторами, которыми я восхищаюсь уже долгое время, и которые испытывают такую-же страсть к музыке, как и я. Мы поделились этой своей страстью в нашем альбоме, и вложили в него все, что у нас есть. Я действительно очень горда им, и с нетерпением жду возможности, когда и у всех вас появится возможность его услышать". Биография Лизы отмечает, что однажды она выступала в Москве на переполненном стадионе Лужники. Российские поклонники Евровидения хотели бы узнать об этом подробнее. "Это было частное мероприятие. Организаторы услышали обо мне и предложили выступить на шоу. В нем принимало участие множество артистов, и меня встречали очень хорошо. Я исполнила песню "Quand on fait l'amour" и реакция аудитории была весьма положительной!". "Я не могу дождаться возможности спеть для вас "N'oubliez pas" со сцены Евровидения, я надеюсь, что вы полюбите ее и поймете ее посыл. Спасибо за поддержку! C полной текстовой версией данного интервью вы можете познакомиться на Facebook странице ОГАЕ Остальной мир. Как мы уже сообщали ранее, в соответствии с темой "Возводя мосты", организаторы конкурса Евровидение и Венская Государственная опера организуют в субботу 17го мая с 12.00 по 13.30 концерт, в котором артисты и их музыка соединит мостами разные жанры и культуры - "Pop Meets Opera". Гости могут ожидать невероятные уникальные выступления, в которых международно известные исполнители классической музыки и конкурсанты Евровидения объединятся на всемирно-известной оперной площадке. В концерте примут участие такие мировые звезды, как Алессио Ардуини (Италия), Даниела Фалли (Австрия), Хуан Диего Флорез (Перу/Австрия), Аида Гарифуллина (Россия), Валентина Нафорницэ (Молдова), Хервиг Пекораро и его сын Марио Пекораро (Австрия), танцовщика государственного балета Вены Иоанна Авраам (Кипр) и The Philarmonics (сборный оркестр из музыкантов Государственного Оперного Оркестра и Венской Филармонии), Венские Комедийные Гармонисты (включая участников хора Венской Государственной Оперы). К сожалению, Пласидо Доминго был вынужден отменить свое выступление из-за болезни. Артисты Евровидения будут представлены Богги (Венгрия), Джоном Караяннисом (Кипр), Мёрландом и Деброй Скарлетт (Норвегия), Молли Стерлинг (Ирландия) и Ниной Сублатти (Грузия). Конечно же, специальной гостьей станет "Королева Австрии", победительница Евровидения Кончита Вурст. Ведущая шоу, эксперт телеканала ORF по культуре Барбара Ретт. "Pop Meets Opera" будет транслироваться по телеканалу ORF III в воскресенье 17 мая в 20:15 в рамках программы “Erlebnis Bühne”, также за шоу можно будет следить в прямом эфире онлайн по всему миру на сайте www.staatsoperlive.com и в контектсе мероприятий "Опера на площади" на площади им. Херберта фон Караяна - перед зданием Венской Государственной Оперы. Билеты на шоу обойдутся от 7 до 60 евро и их можно приобрести здесь. Представитель городского совета по вопросам окружающей среды Улли Сима сегодня торжественно открыла т.н. "Мост славы" через Новый Дунай. Это - полностью обновленный мост "Copa-Steg" длиной в 190 метров, связывающий основную часть Вены с островом Донауинзель. Муниципальный департамент 45 (Управление водными ресурсами) принял решение по случаю проведения в Вене конкурса Евровидение 2015 под девизом "Возводя мосты", придать данному мосту, который все равно входил в планы реконструкции на этот год, дизайн, посвященный Евровидению. Все поверхности, такие как плавучие элементы, освещающие арки, поручни и т.д., не только были окрашены, но и получил музыкально-тематический дизайн. Шестьдесят пластин теперь демонстрируют информацию о всех победивших песнях Евровидения: вы можете использовать свой мобильный телефон для сканирования QR кодов и непосредственно перейти к соответствующей песне. "Я очень довольна новым дизайном моста в главном рекреационном раю Вены. Девиз "Возводя мосты" еще более подходит для Донауинзеля, и я надеюсь, что многие люди решат прогуляться через всю историю 60-лет Евровидения", говорит Улли Сима, представитель городского совета по вопросам окружающей среды. До "Моста славы" (также известного как Copa-Steg или Ponte Cagrana) можно легко добраться на метро U1, станция “Donauinsel”. Также виртуальный тур по мосту вы можете пройти на его вебсайте. Белтелерадиокомпания и столичный караоке-клуб "Sinatra" провели официальную вечеринку-проводы "Uzari & Maimuna приглашают друзей". Перед поездкой в Вену слова напутствия и пожелания удачи дуэту сказали популярные белорусские артисты, медиаперсоны, звезды спорта, селебрити, журналисты. В том числе приглашение посетить мероприятие получил и ESCKAZ.com, команду которого на нем возглавили Евгений Николаев (продюсер эксклюзивного контента, фотограф) и Дмитрий Сапсай (видеограф). Вечеринка прошла в формате караоке-батла между исполнителями. Гости услышали самые невероятные варианты представления песен от популярных белорусских исполнителей из репертуара других артистов. В мероприятии приняли участие: Юзари и Маймуна, члены их команды Денис Лис и Артем Ахпаш, представители Беларуси прошлых лет Тео и Алена Ланская, участники национальных отборов группа Napoli, Алексей Гросс, Aura и Евгений Олейник, группа Muzzart, Анастасия Малашкевич, группа Беатрис, Виталий Воронко, Ирина Дорофеева, нынешний и прошлый руководители национального отбора Ольга Шлягер и Александр Тиханович, и другие селебрити: Искуи Абалян, Виталий Новиков, Василий Раинчик, Алексей Хлестов, Марина Карри, Алеся Боярских, Ксения Барановская, Барбара и Эдуардо, Ольга Туник, Елена Спиридович, Светлана Боровская и другие известные личности. Мы представляем вашему вниманию видеозаписи выступления Юзари и Маймуны, члена их команды Дениса Лиса, мамы Юзари Галины Громович, мужа Маймуны Андрея Мурашко, Тео, Алексея Гросса, а также другие интересные моменты вечеринки. Венский Филармонический Оркестр, Венский Хор Мальчиков, Хор Suparar, Лидия Байх, Кончита Вурст, Left Boy и RSO откроют финал конкурса Евровидение в Вене. Венский Филармонический оркестр начнет исполнение в саду дворца Шёнбрунн. Далее зрителей концерт ждет увлекательное путешествие по самым красивым городам и ландшафтам Австрии, которое завершится в зале Wiener Stadthalle, где выступят звездная скрипачка Лидия Байх с отрывком из первой песни, принесшей Австрии победу на Евровидении - Merci Cherie. Сразу же после нее, Кончита Вурст выступит в сопровождении Венского Хора Мальчиков, многонационального хора Superar и австрийского рэппера Left Boy с официальным гимном конкурса "Building Bridges". Авторы гимна: Давид Броннер, Доротея Фрейберген и Курт Понгратц на текст Давида Малина. Их выступление будет сопровождать Симфонический Оркестра Радио ORF, дирижер Петер Пейцик. Всего в акте открытия будут задействованы свыше 200 артистов. В завершение номера, все конкурсанты шоу выйдут на сцену, пройдя через зрителей по "волшебному мосту". Опубликованы новые фотографии со съемок визиток участников Евровидения 2015. Албания - Эльхаида Дани необычным способом познакомилась с крутыми склонами и зимним ландшафтом Ворарлберга. Армения - Genealogy познакомились с радужной стороной Вены и пережили бурный день радости и веселья. Австрия - The Makemakes познакомились с сельской местностью в Нижней Штирии ранее неизвестных для себя способом. Австралия - В историческом городе Зальцбург, Гай Себастиан открыл что-то родное для себя, и познакомился с австрийским водным спортом. Бельгия - Лоик Нотте в Айзенштадте придал удивительный импульс для романтического города и его жителей. Кипр - Джон Караяннис замечательно провел время на воде на озере Нойзидль в Бургенланд. Дания - Anti Social Media сняли свою открытку на горном ландшафте Тироля, приняв участие в увлекательном состязании. Эстония - Элина и Стиг испытали новый увлекательный вид спорта в Мадзее в Зальцбурге. Финляндия - Pertti Kurikan Nimipäivät посетили Венский Музей Трамваев и получили уникальный опыт со старыми составами. Грузия - Нина Сублатти вместе с известным австрийским фэшн-дизайнером Леной Хошек погрузилась в мир изысканных материалов и ощутила небольшую ностальгию в Граце. Германия - Анн Софи в Вене раскрыла увлекательное сочетание спорта и последних технологий. Исландия - Мария Олафс была приглашена в Бургтеатр в Вену, что встретиться там с актером Маркусом Майером и примерить на себя необычную роль на одной из самых важных сцен Европы. Ирландия - Молли Стерлинг в нетронутой природе Йойса познакомилась с одним из своих интересов с необычной стороны. Литва - Мечта Моники и Вайдаса сбылась в Яунтале, Каринтия. Мальта - Amber поднялась к новым высотам в Целль-ам-Зе и насладилась уникальным видом на потрясающий ландшафт Зальцбурга. Молдова - Эдуард Романюта был тепло встречен во Франкинге членам Группы Сельской молодежи Верхней Австрии и принял участие в традиционной и сложной гонке. Черногория - Кнез познакомился необычным способом с Австрийской кухней в Грундльзее в окружении потрясающего пейзажа Штирии. Нидерланды - Трайнтье Остерхаус пережила необычный день в Кагенфурте и увидела знаменитое озеро Вёртер-Зе с неожиданного ракурса. Норвегия - Мерланд и Дебра Скарлетт взяли в свои руки шлем на красивом пейзаже озера Альтаусзее в Зальцкаммергуте, Штирия. Польша - Моника Кушиньска познакомилась с высоким искуством и имперскими традициями кондитерской Demel. Португалия - Леонор Андраде была окружена невероятным пейзажем в идиллическом винном регионе Вахау и обнаружила в себе неожиданные навыки. Румыния - Voltaj приняли участие в традиционном спортивном состящании Нижней Австрии. Россия - Полина Гагарина поборола в Ваттенсе свою боязнь высоты, для того, чтобы принять участие в подготовке невероятной огромной художественной работы. Сербия - Бояна Стаменов побывала в Бургенланде, где смогла проявить специальную ловкость в традиционных ремесленнических операциях. Словения - Maraaya поближе познакомились с лошадьми в Штирии. Великобритания - Electro Velvet при помощи последней технологии смогли окутать Линц волшебством и заклинаниями. Группа раскрывает, что постановка песни была немного изменена, но это останется сюрпризом для зрителей. «Нелли Эттисон и Йоанна Бейбом – наши бэк-вокалистки. Йоанна не выступала с нами на национальном отборе в Дании, но мы же должны были что-то изменить для Евровидения и поэтому, чудесная Йоанна присоединилась к нашей команде! :D"
Лондонская превью вечеринка Евровидения в этом году пройдет в воскресенье 26 апреля 2015 в Cafe de Paris, Лондон, Великобритания. По привычной традиции, вечеринка распахнет свои двери вечером воскресенья для выступлений участников Евровидения 2015 и специально приглашенных друзей, и дискотека продлится до утренних часов понедельника. Рэй Каруана - Why Do I Always Get It Wrong? и бывший комментатор Евровидения на BBC Падди О'Коннэл.